334 pages | 119 B/W Illus. Even though time-dependent spectroscopic techniques continue to push the frontier of chemical physics, they receive scant mention in introductory courses and are poorly covered in standard texts. 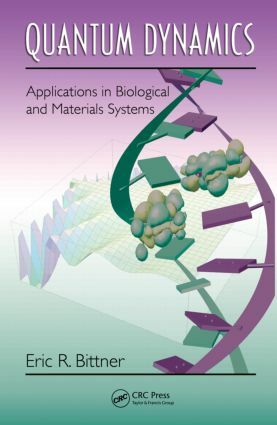 Quantum Dynamics: Applications in Biological and Materials Systems bridges the gap between what is traditionally taught in a one-semester quantum chemistry course and the modern field of chemical dynamics, presenting the quantum theory of charge and energy transport in biological systems and optical-electronic materials from a dynamic perspective. Taking a pedagogical approach, the book begins by reviewing the concepts of classical mechanics that are necessary for studying quantum mechanics. It discusses waves and wave functions and then moves on to an exploration of semiclassical quantum mechanics methods, an important part of the development and utilization of quantum theory. The main focus of the book is the chapter on quantum dynamics, which begins with a brief review of the bound states of a coupled two-level system. This is discussed with a time-independent as well as a time-dependent perspective. The book also explores what happens when the two-level system has an additional harmonic degree of freedom that couples the transitions between the two states. The book reviews different ways in which one can represent the evolution of a quantum state, explores the quantum density matrix, and examines the basis for excitation energy transfer between molecules. Later chapters describe the pi electronic structure of conjugated organic systems and discuss electron-phonon coupling in conjugated systems and transport and dynamics in extended systems. On an accompanying website, Mathematica® applications and codes can be downloaded to illustrate the theoretical methods presented, and the book offers ample references for further study. The book and website combine to provide students with a clear understanding of the theory and its applications. Eric Bittner is currently John and Rebecca Moores Distinguished Professor of chemical physics at the University of Houston. He received his PhD from the University of Chicago in 1994 and was a National Science Foundation Postdoctoral Fellow at the University of Texas at Austin and Stanford University before moving to the University of Houston in 1997. His accolades include an NSF Career Award and a Guggenheim Fellowship. He has also held visiting appointments at the University of Cambridge, the École Normale Supérieure–Paris, and at Los Alamos National Lab. His research is in the area of quantum dynamics as applied to organic polymer semiconductors, object linking and embedding directory services (OLEDS), solar cells, and energy transport in biological systems.